The first thing my sister Cat and I had to learn before we went to the Central Anatolian region of Cappadocia was how to pronounce it. We used all three pronunciations interchangeably until we heard the word articulated by the Turks as kap-ah-DOK-yah. That almost settled it but then yet a fifth variant emerged when I discovered that Greeks say kap-ah-doe-KEE-ah. It is not surprising that a place with multiple versions of its name would offer travelers so many delightful diversions. 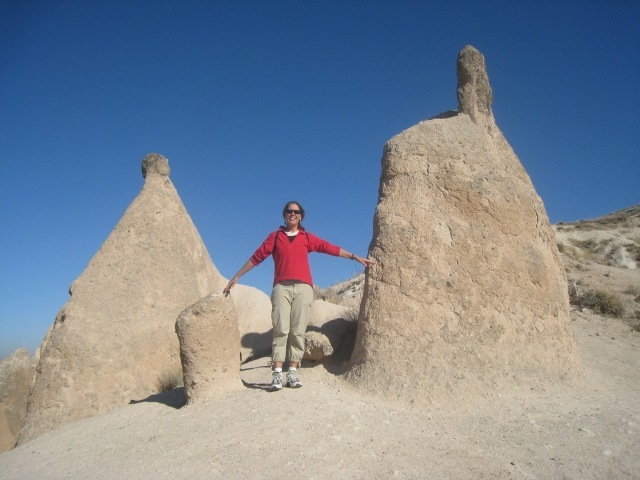 Cat and I stayed four days in Cappadocia in October, 2011 and rued it was not enough time to do and see a fraction of the region’s activities and sites. 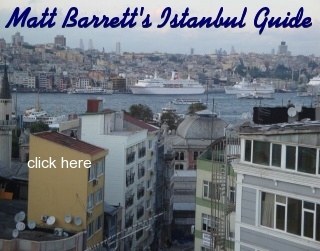 But we packed it in with daily adventures which I shall recount, starting with our departure from Istanbul. From Istanbul’s secondary airport, Sabiha Gökçen Airport, we flew to Kayseri, a 1½ hour flight. Ambling through the airport we stopped to read a tribute to Sabiha Gökçen whose story mesmerized us. At age 23 she was the first female pilot in the world and Turkey’s first female combat pilot . In1996, the U.S. Air Force published a poster of the 20 greatest aviators in history and she was the only woman included. Gökçen, whose name means “belonging or relating to the sky,” died in 2001 at the age of 88. Before boarding, we bought a salad-to-go at a fast food restaurant and headed downstairs to our departure gate. About 15 minutes later the cashier appeared with a big smile to deliver our Lonely Planet which unawares we had left behind. How was he able to leave his station? How did he find us in this fairly large airport? How did he know it was our book? We thanked him profusely while he acted as if hunting down and returning a customer’s misplaced property was just part of his job description. The incident set the tone for the rest of our journey where again and again we encountered kind, friendly, honest Turkish people. 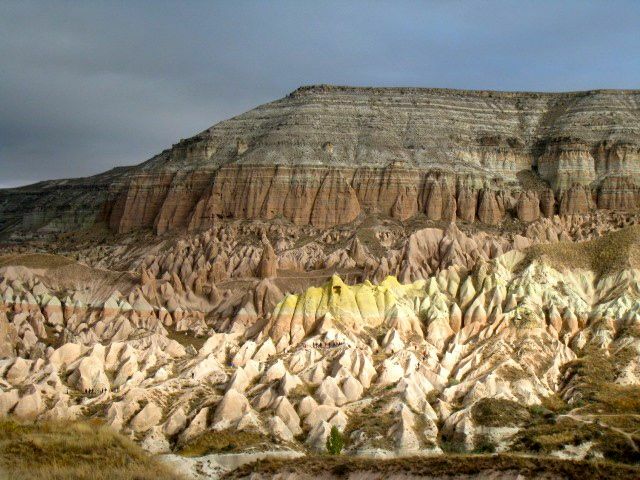 What is the allure of Cappadocia? In a nutshell – an exceptional landscape and a mystical history. Millennia ago volcanic mountains formed outlandish rock pinnacles known as “fairy chimneys” whose whimsical shapes made my sister and I laugh out loud. Erosions created sensuous folds in the earth causing us to gawk with glee. The mountains’ soft clay or sandstone allowed early Christian hermits, initially hiding from pagan Romans, to carve elaborate cave churches and refuges in daunting spots atop rocky hills. 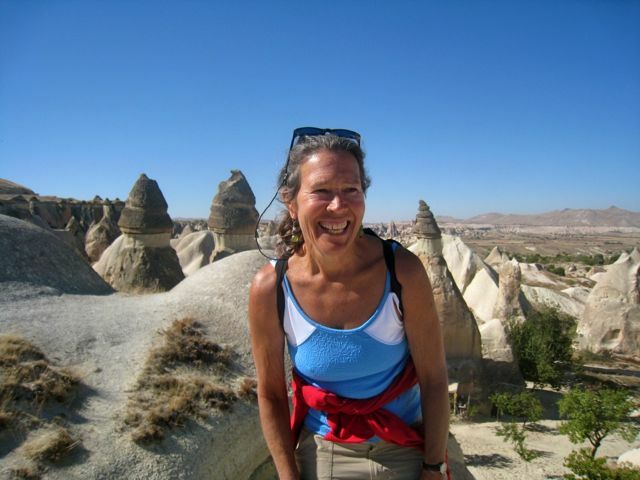 Some of Cappadocia’s marvels are accessible stepping out of a coach tour bus, but so many of its other wondrous phenomena require hiking the backcountry dirt paths that connect the area’s two dozen or so towns and villages. 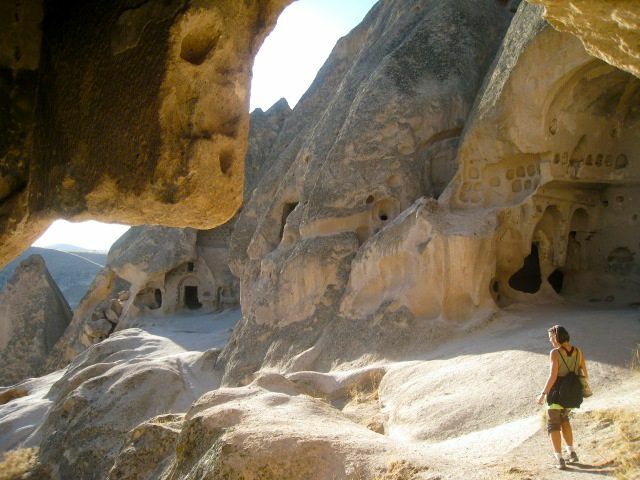 Needless to say, Cappadocia is a hiker’s haven. 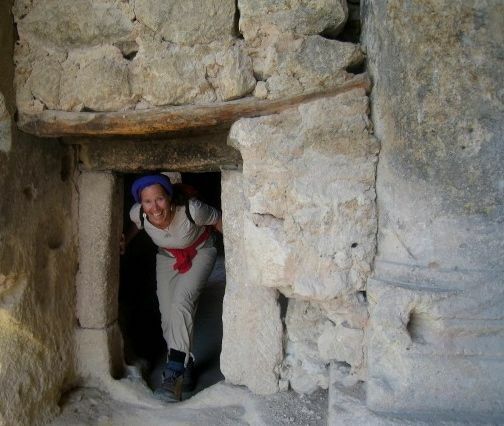 Caves converted into comfortable accommodations are a premier tourist feature and we, too, indulged in this exotic treat. 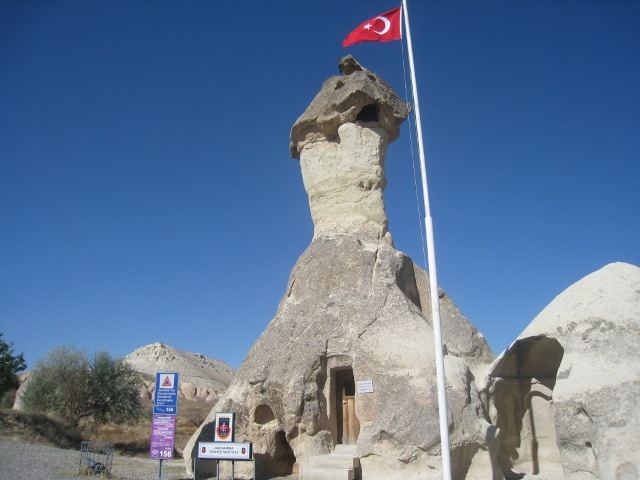 We based ourselves In Goreme (population 2500), located in the center of Cappadocia. We stayed at Aydinli Cave House which consists of six cave rooms and a lobby that was formerly a stable. The owner Mustafa was born and raised here before restyling his family home into a darling little hotel decorated with bygone family relics which give the premises an earnest authenticity, notwithstanding Wi-Fi connections in each cave room. Mustafa’s wife cooked menemen for breakfast which is a delicious omelet. Although it is made with common ingredients -- tomatoes and green peppers -- its taste was foreign and new to me. She served her homemade jam called pekmez made from grape resin. Fresh honey was set on the buffet still in its waxy honeycomb. Our first hike was in Rose Valley, so named due to the rocky landscape’s stunning pink patina. Seeing several trails, we asked the guy who dropped us off which path to take and he laughed, “Oh it doesn’t matter. You will get lost and that’s part of the fun.” Rose Valley is small enough that we correctly surmised that by walking two to three hours in the general direction of our destination we would get there. It’s impossible to feel lost when so many treasures are to be found on whichever path you choose: undulating rock mounds looking like Himalaya-size candy gumdrops, a winery storage in a cave two stories high with a perplexing ladder, windows in a cave home, a cave church with orange frescos and a dizzy maze of rooms. Reaching the main dirt road, we came upon a motorcyclist selling fresh squeezed pomegranate juice. With saddlebags and bungee cords, he managed to carry a little table, juicer, cups, the fruit and even bottles of local wine and guide books. He’d ride up and down until he spotted susceptible tourists willing to buy his modestly overpriced products. Impressed by his clever enterprising spirit, Cat and I succumbed and bought a glass of “nar” juice. Fresh pomegranate juice, a rarity in U.S. juice bars, had already become a daily ritual during our Turkey trip. From Rose Valley we walked a kilometer to Cavusin. Unless you’ve studied Turkish, you’d never guess Cavusin is pronounced sha-vou-SHIN. Cavusin was once a Greek village. I don’t know when it stopped being inhabited by Greeks nor whether their absence was due to the Turkish government relocating the people because erosion and harsh weather made their rock-hewn homes unsafe, as the Turks maintain, or whether the residents were forced to leave, a tragedy that befell many Greeks in Turkey in the early 20th century. I suspect the village had a Greek name when Greeks lived there because this is the case with several other Greek towns in Cappadocia that were depleted of Greek families during the 1920s “population exchange,” and now bear Turkish names. After the wilderness of Rose Valley and sleepy Cavusin, Cat and I were at first flustered by the flocks of tourists converging on this site. Those dreadful mass tourism coaches were idling in the Museum parking lot within lazy reach of tacky souvenir stands. We actually had to wait in line to enter some caves. 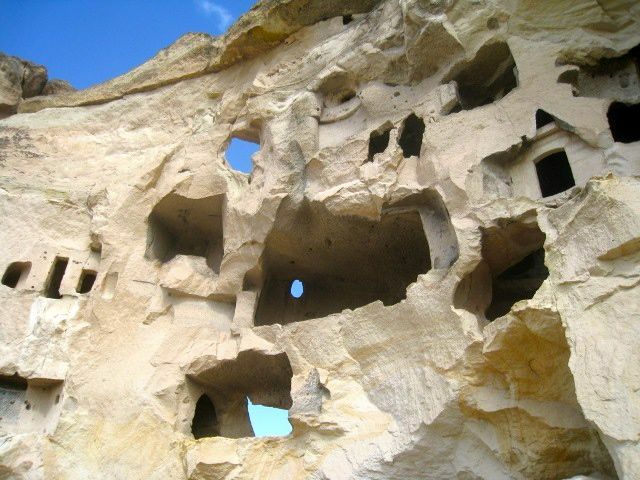 But all that is really of no import because Goreme’s one-time monastic settlement, known as the Open Air Museum, is utterly magnetizing. 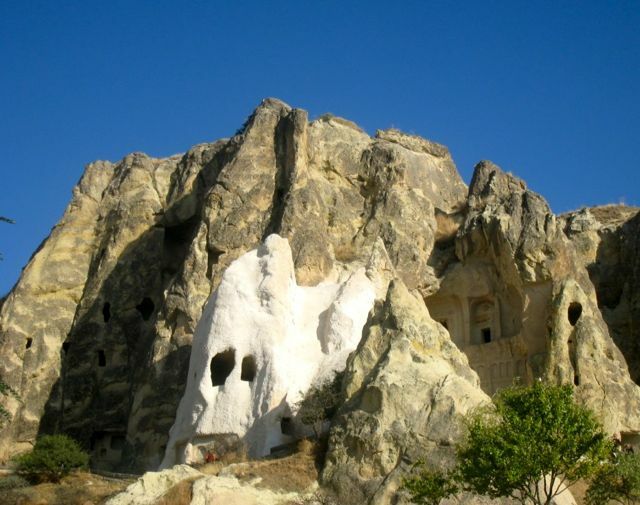 The cave churches, dating from the 10th, 11th and 12th centuries, are probably the most popular attraction in all Cappadocia. I’d say convenience of location right off the road is the chief reason. Setting aside my ornery observation, the church caves truly earned their World Heritage Site status. They are incredibly sculpted, almost to perfection, with vaulted domes, naves, apses, columns, altars and refectories – a word I confess I had to look up. A refectory is a communal dining hall in a religious house, college or other institution. In Goreme, refectory tables and benches were carved out of the rock and I doubt those anchorite diners used cushions. The scene brings to mind a stoic picnic site which is probably why an ungodly number of tourists seem compelled to sit down and pose with pretend cups raised in the air for a toast. The most striking cave in the entire complex is the stark white rock nunnery that pops out at you at the Museum’s entrance. I envisioned the triangular formation as the head of a hooded albino friar amongst his more somber brethren. 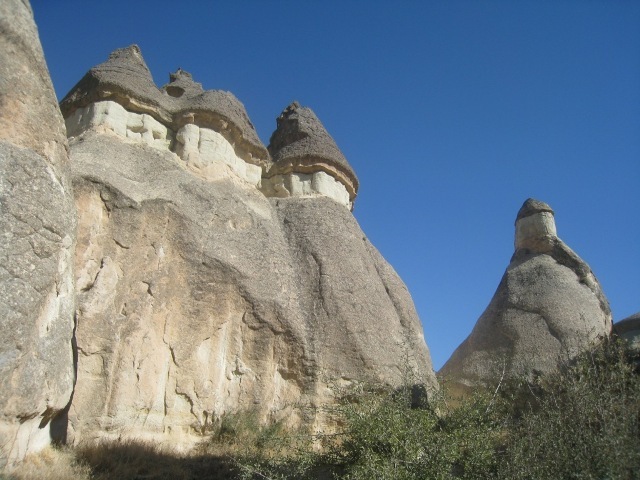 As should be obvious by now, the very nature of Cappadocian topography stirs the imagination in provocative ways. It makes me wonder about a paradox: how did those rigidly ascetic anchorites relate to a terrain I behold as so fanciful, unorthodox and intoxicating to the imagination? About fifteen years ago some entrepreneur began offering hot air balloons across Cappadocia’s magnificent landscape, and now they are a de rigueur sunrise activity. We got up at 5:00 am but our flight that day was a bust. Assessing the fast winds and abundant clouds, our captain determined his passengers, sixteen of us, would not have a memorable excursion, so he canceled and gave refunds or credit for the next day. At $200 per person, his was a costly decision. Several less than honorable companies green lighted their balloons, thereby condemning their clients to a twenty minute ride with limited visibility; once in the air no one gets a refund. When I reached 100, I quit counting the balloons, and realized I was witnessing a visible display of lots of money in the sky. The scene of dozens of circus-like hot air balloons floating over a fairy tale landscape lent the activity a fantasy quality. To clinch the romance of the venture, upon landing we were handed glasses of champagne. It did not go unnoticed by Cat and me that our $200 payment included the cost of this fancy finale, but it would have been churlish of us not to make a victory toast, and so we did, but we would have been much happier with a glass of fresh squeezed pomegranate juice. Given that there were so many places yet to explore in Cappadocia, I proposed that we skip Dervant Valley because we already saw it by air. My prescient sister vigorously vetoed me and since between us we jokingly regard her as the dominant twin, I acceded. A 45 minute walk away is Pasabag, another thoroughly entertaining site that to me evokes some kind of stomping grounds for gremlins. 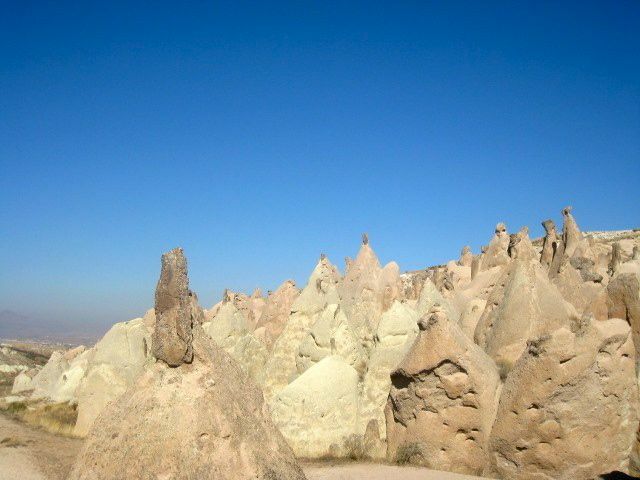 The “fairy chimneys” (called hoodoos out West) are comical rock spires, like minarets, some conspicuously phallic. 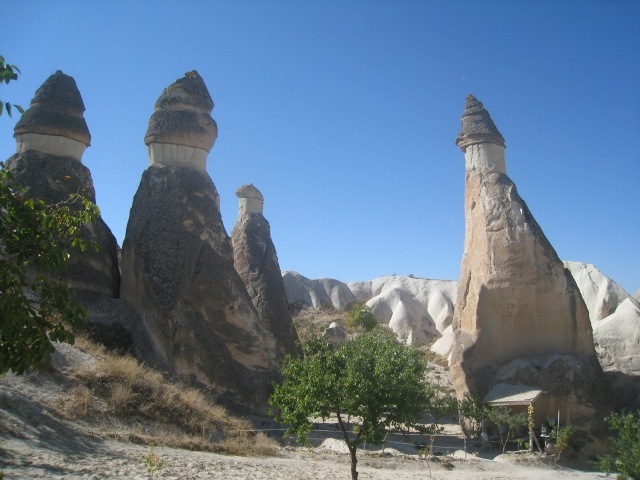 Hilariously, the Pasabag police station is housed in one of these fairy chimneys. Although it is really really really hard to pick a favorite spot in Cappadocia, I’d have to say that Dervant Valley and Pasabag are my number one choice. Ihlara Valley is a ten-mile gorge cut into volcanic rock with a hiking trail pretty much hugging the Melendiz River from start to finish, one of the few hiking locales with a body of running water. The path is almost entirely flat with few obstacles and in some sections as wide as a car lane. This type of terrain encouraged Cat and me to get into our “New York City fast clip” mode for a hearty work-out. Gurcan, accustomed to casual hikers in Ilhara Valley, was thrilled, although he admitted our pace was a bit of a challenge. Most visitors do not walk the length of the valley primarily because the towering cliffs hold another attraction. Over one hundred archaic churches with frescos are carved into the rock. We were told some of the first Christians escaping Roman soldiers fled to Ilhara and created this unique historical treasury. 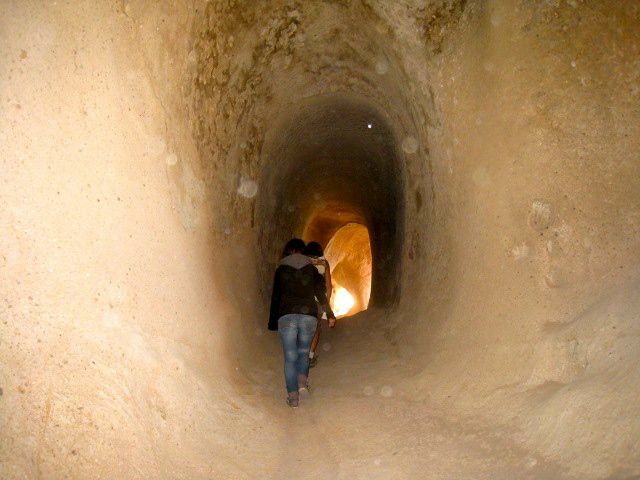 I read somewhere that 80,000 people once lived in the valley and were housed in some 4,000 cave dwellings. During this period Ilhara was known as Peristrema. Reaching any one of the cave churches requires diverting from the path in a steep climb. Not that Cat and I are intimidated by ascents; the truth is, we were a little “churched out” and longed for some rigorous exercise. The Ihlara Valley hike ends at Selime village where Cat got a lovely camel motif handbag and against her better judgment, because we were out there in the sticks, she bought it. Later we found a similar version in the coastal city of Selcuk for half the price. Just like at Istanbul’s Grand Bazaar, both of us got out-bargained left and right by theTurks. They aren’t dishonest; they are just consummate salesmen who probably mastered the art of negotiation when they were still teething. Cat and I saw plenty of stray dogs in Cappadocia and the most astonishing thing is how the Turks treat them. It isn’t just a matter of frequently observing restauranteurs, shop keepers and others tossing quality left-overs to stray dogs. While bicycling on a rural road, we saw a taxi driver take time to pull over to give some meaty bones to one stray dog who had decided to accompany us on our bike ride. I thought the driver was just throwing away his lunch and it was a coincidence that a dog was there to eat it. I asked him about this gesture and he replied that he always saves uneaten food to give to stray dogs and he saw this dog and intentionally stopped to feed it. And, it isn’t just a matter of a smart municipal policy wherein homeless dogs are spayed and green tags attached to their ears to indicate the operation, presumably so that untagged dogs can be identified and spayed too. Those two examples of charitable gestures would suffice to elevate the Turks to good citizens in our eyes. The uncanny thing is that we saw again and again Turkish people petting and giving love, care and genuine attention to stray dogs, whereas in most other societies ownerless animals are regarded as outcasts and treated with scorn, or worse, poisoned. Cat and I feel that the way the stray dogs are treated speaks volumes about the kindheartedness of the Turkish people. For a number of years Cappadocia has been on my wanderlust radar for I rightly suspected it was a grand playground of natural and cultural proportions. 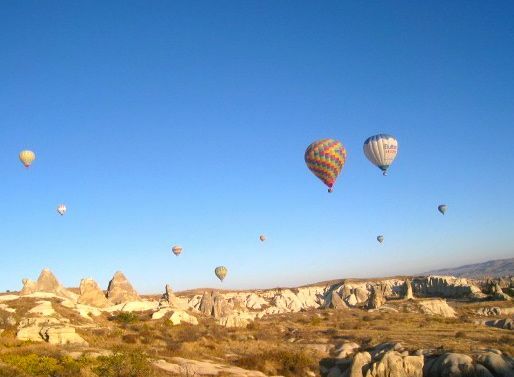 It is not always the case that a place exceeds my expectations, but Cappadocia assuredly did. In fact, it is now one of my top ten destinations, a statement I do not make lightly having traveled to over eighty countries. Well, maybe I should qualify my ringing endorsement of Cappadocia to say that if you love rocks and nature and hiking and quirky terrain and caves and mystical settlements and terrific food and friendly locals who are pleased to meet you even if you are a tourist --- well, then in that case, you better put Cappadocia on your bucket list.